The Brogues love to ceilidh - they’ve been doing it for years, and they don’t plan on stopping anytime soon. And they’d love to help you with your next one. With a history of organising dances and concerts for visitors on the Isle of Skye (home for two of them), they’ve since moved further afield, and have been involved in leading events across the UK and beyond. Active in writing their own tunes, the band’s sound is grounded in Scottish traditional folk music, with a modern feel. They’re a versatile bunch, though, adept at throwing in the odd fun quirk every now and then, and they’ll happily sing you a song or two (English or Gaelic) - just ask! In days gone by, almost every township or village in the Highlands and Islands of Scotland would have had a ‘ceilidh house’ - a place where people felt welcome, and found good company. It was here that folk shared the gift of entertaining each other in song, dance and story. It’s a custom that’s made Scotland famous throughout the world, and it’s this kind of atmosphere that the Brogues seek to create wherever they go. So whatever your event - big or small - get in touch and we’ll see what we can do. It would be our joy to help. thoughts that can't be told. but less dark and curly. folk will dance and worries ease. "True professionals, and some of the nicest and most laid-back guys you'll meet." Have a listen to some of our recent recordings. 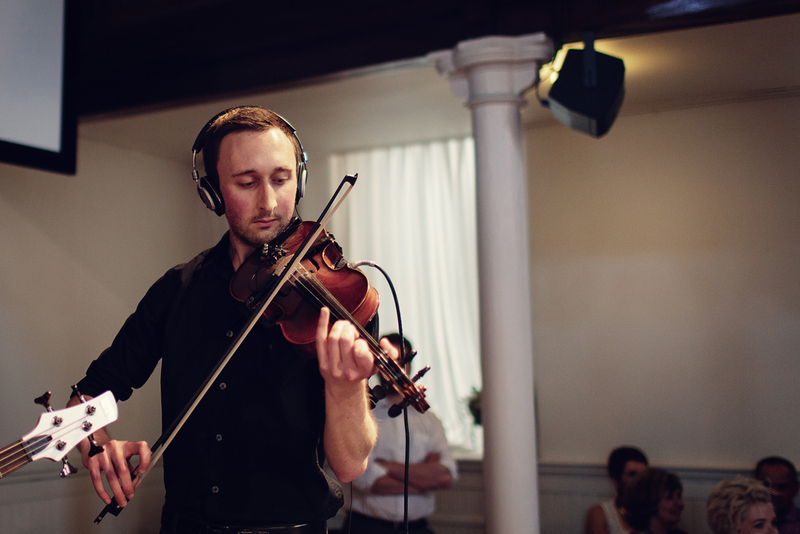 "THANK YOU SO MUCH FOR PLAYING AT OUR WEDDING AND FOR CALLING THE CEILIDH SO BRILLIANTLY. IT ABSOLUTELY MADE THE NIGHT AND WE COULDN'T HAVE ASKED FOR A BETTER PARTY, SO HUGE THANK YOU!" "WE HAD A VERY INTERNATIONAL BUNCH AT OUR WEDDING BUT THE BROGUES DID A GREAT JOB OF KEEPING EVERYONE IN STEP AS WELL AS HAVING A GREAT TIME"
"Given that 80% of our guests had never ceilidh’d before, the Brogues did a wonderful job of leading dances where everyone could get involved and felt very much part of the celebrations. We’ve had so many compliments from our guests about how much they loved it and can’t wait to get ceilidhing again! Thank you!" "We had the Brogues play for the evening do at our wedding and were so glad we did! Professional, prompt, talented and fairly priced, they helped us and our guests ceilidh the night away! They come with the highest of recommendations from us." "The Brogues played and entertained a 60-strong private birthday celebration ceilidh at our village hall. Their skills, musicality, repertoire, dance ‘calling’ and organisation were all excellent, well received and responded to by an all-age gathering. Great band - wonderful music - highly recommended!" We realise how tiring it can be to organise events like this - we’ve done it ourselves! - so we aim to keep our part of the process as simple as possible. Then when the day comes, our job is to help you relax and enjoy yourselves - ceilidh therapy, if you will. A lot of us have been to bad ceilidhs, and know how dull and awkwardly quiet (or annoyingly loud) they can be. But when a ceilidh goes well, there’s nothing quite like it - ridiculous fun, accessible and enjoyable for all ages. We’ll work with you to make it an event to remember. Motivated by the love of ceilidh and not the love of money, we try and keep our prices reasonable. And our experience extends well beyond playing music for dancing. We could help you with anything from leading singing at your wedding ceremony, bridal entrance, background music, covers sets or disco (you can even send us your playlists from iTunes/Spotify/...). Something else in mind? - just ask! It’s your event, so feel free to make special requests - if we can, we’ll help, and if we can’t, we’ll try and point you in the right direction. CONTACT US now for a quick, personalised quote. Our services can be tailored to your requirements, so just inform us if you have any special requests. Do let us know if you're organising a charity or fundraising event and we'll try our best to help you run a low-cost gathering. "Book these guys for a first class hoedown!"